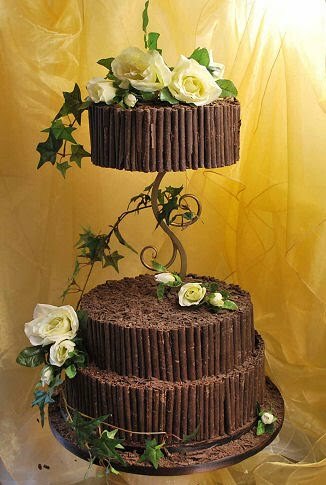 If you are a chocolate lover then welcome to wedding cake chocolate heaven, there is nothing more tasty than a chocolate cake decorated with chocolate curls (a.k.a chocolate cigarillos). 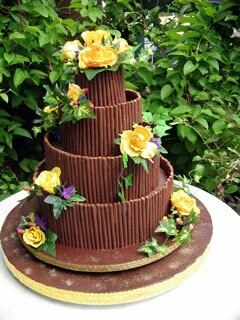 Combine this scrumptious cake with either fresh or edible flowers of your choice for a chocolate dream wedding cake. Beautiful chocolate cigarillo cake designed to look as though the chocolate swirl pillars are floating on a bed of red roses. 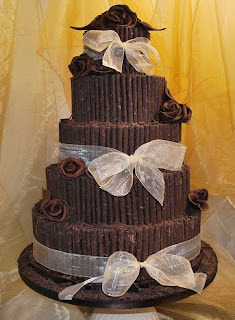 Beautiful three tier chocolate wedding cake decorated with swirls of milk chocolate. 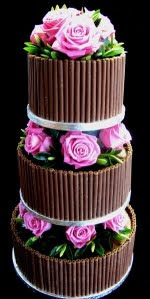 The tiers are separated with fresh pink roses. 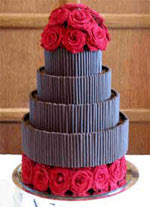 A big chocolate 4 tier swirl wedding cake decorated with chocolate curls and lovely fresh yellow roses. 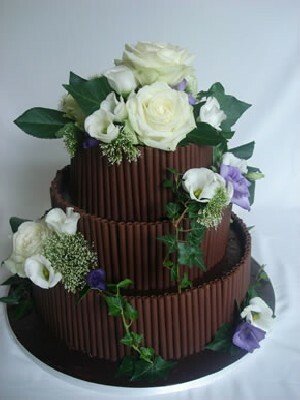 Three tier chocolate cigarillo cake with fresh white roses and smaller white and purple flowers. 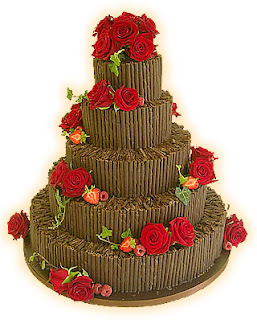 Four tier wedding cake decorated with chocolate cigarillos and fresh bright red roses and strawberries. Five tier dark chocolate curls wedding cakes decorated with yummy chocolate flowers and sweet sheer bows. Three tier chocolate cigarillo cake with beautiful silk flowers.